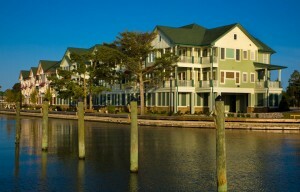 These twenty upscale condominiums are built in side-by-side buildings along the marina in the Marshes Light community. Condominium owners are members of both the Master Association and the Marina Condominium Association. Each building has its own elevator, dedicated parking spaces under the building, kayak storage racks and amazing water views. Walk along the waterfront boardwalk straight into town to enjoy all that historic Manteo NC has to offer.